If this is not your first time at the classical education rodeo, then you've probably run across The Well-Trained Mind at some point. Susan Wise Bauer (author of The Story of the World series) and her mama, Jessie Wise, collaborated on this remarkable plan for classical education at home. You may have guessed by now that I'm a Classical Conversations groupie, so to speak, and I fully support founder Leigh Bortins and her fabulous program. It has worked so well for our family, and you can read about my experiences here and here. Well, while surfing the internet doing my own research the other day, I ran across someone's blog post that called CC 'classical-lite' (we'll come back to that in a minute). Hmm. . . that got me thinking. Is The Well-Trained Mind really the end-all-be-all for classical homeschoolers? So, I thought I'd do a quick little comparison (I say 'quick' because I'm only going to touch on the biggest differences that matter to me. One could certainly spend more time dissecting and comparing both books, but I promise that I do have a life, and therefore I need time to get off the computer and live it. ;). Both books discuss the Trivium at length in the beginning, giving explanations of the three stages of learning and development (grammar, logic/dialectic, and rhetoric). 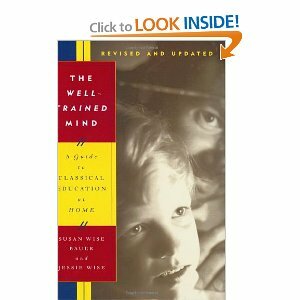 Bauer says the Trivium is a "three-part process of training the mind" (WTM, p. 13). I love this short-and-sweet definition! However, the biggest difference to me between these two books, which explains why The Core looks to be less than half the length of The Well-Trained Mind, is that The Core is not a comprehensive guide to classical education at home. What?! But I'm new to CC and everyone keeps telling me to read The Core! Yes, certainly read The Core if you're in CC, but do so knowing that its focus is on the grammar stage - the Foundations level of the program (children under 13). The first time I read it, I didn't understand that. If you're in CC, you may be happy to hear that Leigh's next book about the Essentials program (the next level up in Classical Conversations) is being released this Fall. This book will instruct you, step by step, on how to give your child an academically rigorous, comprehensive education from preschool through high school. . .
As in any classical education curriculum, the Bauers stress memorization, but they don't tell you what to memorize (aside from the list of leaders and wars in the back of the Kingfisher History Encyclopedia). I know what some of you might be thinking: What? Are you a baby that has to have things spoon fed to her? Well, no, but if there's a program out there that already has these 'pegs' (quality content for memorization) ready to go, why reinvent the wheel? The main criticism I've heard of WTM is that it takes hours of preparation each week. Now, I can't speak from experience; I've yet to try its method, but this seems about right if the parent has to piece together the memory work each year as she goes. Classical Conversations, the program described in The Core, already has memory work for 24 weeks in seven seminars (subjects). I don't have to go fishing for things to memorize each year. It seems to me that CC would fit in nicely with WTM. Therefore, I cannot agree with the blogger who called CC 'classical-lite.' I believe Classical Conversations can be used as a tool to provide the memory pegs for the classical education. To bring both views together, I can picture WTM as the car and CC as the map to get the car to its destination of a rigorous classical, Christian, home-centered education. Does that make sense? I'm sure some of you reading this have experience using the two together. Do they complement each other? I've pretty much decided that we're going to pick up some components of WTM next year when we start first grade, and I'm excited to see how our CC memory work will plug in. I say 'some' because we won't follow WTM's suggestions to the letter. For example, WTM uses The Story of the World series to cycle through all of history in four years. CC cycles through history in three years, so we would adjust WTM's notebook plan to fit our own schedule. The Well-Trained Mind is not a book of science, a book of history, a book of literature, or a book of theology. It is an overall plan for education, laying out an entire curriculum for the home educator. This overall plan for education must have a theological center which encompasses every single subject. But who is responsible for providing this theological center? Should my mother and I lay it all out for you, so that you can give your child a godly education?
. . . when using the third-grade A Beka Book grammar text, I found myself continually encountering a particular view of salvation which I thought was limited and (in the end) wrong. The exercises continually refer to “getting saved” and “accepting Jesus” as though the central event of salvation is a single point in time during which the child is instantly transformed from pagan to Christian in the blink of an eye. Yet our worshipping community is centered around the reality that belief in Christ is an ongoing discipleship of obedience, not a split-second decision, and that “being saved” is only a partial description of salvation. Hmmm. . . I'm not Reformed or Calvinist and certainly don't believe in limited atonement, but I do believe there is a point where Jesus "saves" you and you're transformed into a new creature (2 Corinthians 5:17). Her blog post is an interesting read if you have a couple minutes. Well, that's all I the time I can devote to comparing and contrasting these two wonderful books. I believe both works deserve a place on any classical, Christian educator's book shelf, and I don't believe that one is necessarily superior to the other. However, since I am a Classical Conversations mama, I tend to follow more of Leigh Bortins's advice right now, although, I am excited to incorporate some of Susan Wise Bauer's suggestions in the coming years. What about you? If you're a CC mama, have you had success using WTM? I'd love to hear your thoughts, as I know that many, if not most of you have more experience than I do. Share away, friends! 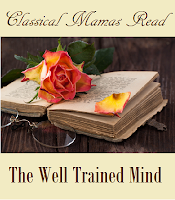 If you'd like to see what other mamas think about The Well-Trained Mind, visit the Classical Mamas Read link-up at Living and Learning at Home! Great post! This is a very helpful comparison for someone who hasn't actually read through either book =) The Core will probably be the next book I read through in the Classical Mamas Read series. I think my biggest problem with taking the leap into CC is that I can't figure out exactly how I would 'mesh' it with what we are currently doing (that I really like!) and have a hard time being willing to spot the cost of CC to find out...The biggest pro for me is all of the extra memory work (that I wouldn't have to come up with myself) because right now we are just doing Bible, poetry, and recently added history. Maybe that, along with meeting like-minded people, would be worth it! Thanks for linking this up to Classical Mamas Read! I enjoyed reading your thoughts! The thing I loved most about WTM is all the lists and lists of resources for each subject and each level. I love CC and that everything is laid out for me, but of course there are times when my daughter wants to know more, wants to go above and beyond the history sentence or science lists. I like being able to pull out WTM and head to the library to find more good books about what we're learning. I also liked her descriptions of all the different math and reading and spelling programs out there, it was a tool I used in helping me choose which curriculum to use this year. As a homeschool mom just finishing up our 17th year, I've learned to acknowledge the truth of Ruth Beechik's statement that goes something like: any homeschool curriculum works if the mother does. We tweak everything, combine approaches like TWTM and Trivium Pursuit's Teaching the Trivium, and focus a lot on reading. The memory list of CC sounds wonderful; I'm terrible at making up memory lists so we haven't done much of that, but we have memorized a lot of Bible, Psalms, hymns, and catechism as well as poetry. One thing I've learned over the years: no approach will work for every member of every family every year--but most things can be tweaked to work. I'm clearly no expert as my oldest son is just starting his first grade work, but I have read both books cover to cover more than once and we incorporate parts of both of them into our schooling. My "issue" with CC is that I feel like it really leaves out literature and its importance. I appreciate the emphasis on memorization, but I just can't help but feel like they gloss over the idea of reading to your children and having your children reading quality books as an integral portion of homeschool. I also feel a bit like they don't think that parents are capable of education their children at home through high school without THEIR community. It feels a bit patronizing and cliquish to me. On the other hand, TWTM can be both overwhelming in their presentation but vague at the same time as well which is frustrating. It also feels like to follow their method of classical education it would take a very specific personality and learning style in the child in order to get through all of what they suggest. If I were going to "rank" them. I would say that, for me, because of the different emphasis on reading and literature that TWTM is more traditionally classical and that CC is "classical lite". However, I try NOT to rank them in my mind like that and instead take from each method the things that work best for my family and enjoy the best of both worlds. I appreciate the blog discussing this. Thanks. J.C., thanks so much for the great comment! You have some really valid points, and I love your statement about taking from each method and putting together something that works best for your family. I like LOTS of things from WTM, and I'm sure I'll incorporate their notebooks next year. Great discussion! Thanks for taking the time to share your thoughts! Thank you for this insight! I just started reading "The Well Trained Mind" and "The Core" is on my list. I have noticed the lack of Christian focus in "The Well Trained Mind", but, according to their blog, it does seem as though it was not fully intentional. I also think that, though I would love to have a game plan laid out for me as to how to incorporate my own beliefs into a classical curriculum, it does reach a wider audience. I love that fact because it seems to me that given the tools to think and reason for yourself would bring about a greater ability to discover the One True God rather than, for example, being told what to believe. Which happens inside and outside of Christianity. Thanks for the comparison Melody! And Dusti Rae, I totally agree that a good education could help people think more clearly and hopefully discover God. All truth is God's truth, right? I haven't fully read either book, (but I want to!) but I am guessing that is where the WTM is coming from. I agree, Jenny! Thanks for stopping by, friend! I just stumbled upon your blog looking for some comparison btw these two. I just finished reading WTM. I haven't read The Core, but I have been to several open houses at CC campuses to observe. I am very impressed with both. It seems to me that WTM covers a lot more information but, as you pointed out, it would take more time on Mom's part to plan ahead. Also, with WTM, they suggest you start at the beginning (the Ancients), no matter what grade you begin. With CC, you have to start on whatever cycle they happen to be on that year. I like the idea of starting at the beginning. Either way, they are both excellent, and our children will get a much better education than they would in a public school (or many private schools, for that matter). Thanks for taking the time to blog about this!